I cannot say if this is an outstanding deal or not, but it may suit someone who doesn't want any up-front cost. Our local Robins & Day Peugeot dealer is running this as their "Westfield Promotion". It is only available in white at this price. The Just Add Fuel deal includes everything bar the fuel for the period of the agreement. I've included a link to the nearest thing I can find for it. 1. Call in to Robins & Day to claim this offer. 2. Nil deposit and payment of £149. 3. Only 1 deal per houshold is available. 4. Must be ordered between 6th Feb and 15th March. 5. Vehicle is 208 1.0 access VTI 3 door in white (metallic paint and any other options chosen would incur extra cost). 6. Finally we are that convinced you would love the drive we are offering £10.00 fuel on completion of a test drive. If anyone can come up with more info, please post it on here. Thanks. Anyway, I have spoken with the dealer concerned and now have much more info. It turns out that (despite saying "Just Add Fuel" on the flyer) it is a form of hybrid "Just Add Fuel" deal. The principle differences are that it does NOT include insurance, nor maintenance. So not as good a deal as it first looked. Still, it may be of interest to some, so here's the info. - There is zero deposit - confirmed. - There is a "Document Fee" of £160 at the beginning. - There is an "Admin Fee" at the end, should you choose to hand the car back, of £90. - There is no insurance included (this may open it up to any age - I didn't ask). - You pay your own repairs. - It is a 3 year term. - It has a 3 year warranty. - It will do circa 70 MPG (I was told). - It is free for road tax. - It includes AA cover. - Mileage is 6000 miles per year. - Excess mileage is 6.9p/mile, but they said most people don't pay that as they elect to either P/Ex the car or buy it outright at the end of the term. 2. Buy it from them for a fixed fee, agreed at outset. The cost is £4308. Mileage is then irrelevant. 3. Part Exchange it for something else. I was told that most people either replace it during the 3 year term, which is what they seemed to prefer (quote "seemed" - I am just picking that up from their sales style, so it's only my opnion). If you do that, it just starts another 3 year period from when you do the swap-out. There is an option to include all maintenance. This is £13 per month extra. There is an option to include all maintenance and insurance. This is £50 per month extra. That figure could vary if you have anything that would bump up the inusurance. That's all the info I have. Again, I can only apologise if anyone thinks I should know more than that. It still stikes me as a reasonable deal for anyone who has only £309 and wants to drive out of the garage with a new car of this type. There may well be better offers on the market. That's great. I just spotted this one and thought I would share it. upfront for 107 is around 2k and your annual mileages are limited to 6667miles, so i'm sure the deposit for 207 will b more than 2k. Otherwise good deal I think. 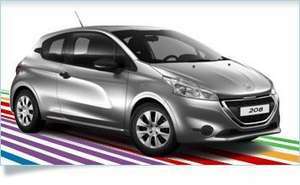 208 Access (inc. metallic paint) initial rental £2,026, optional final rental of £4,510. I've just posted some more info from the flyer. It seems pretty clear about Nil deposit, which is different from the T&Cs on line. Go to a good leasing or contract hire company and you will get this cheaper. Maybe not insurance included but as they utilise fleet discount codes they're able to offer better deals. unless they changed the terms of this, then even if you make the final payment, you never actually own the car and you have to pay them a few hundred quid every year for life. so imho, either go for a decent lease, or get a cheap loan and buy outright. cold from me. do you need 2 years no claims? I would bite your hand off for this deal. Anyone know of similar in Glasgow? Seems like a pretty good deal. unless they changed the terms of this, then even if you make the final … unless they changed the terms of this, then even if you make the final payment, you never actually own the car and you have to pay them a few hundred quid every year for life. I don't think you have to make a final payment. Just hand the car back. I'm really hoping someone else might have more info on this specific deal, since it would seem to be better than the regular "Just Add Fuel" offer, in that it has no deposit. I have e-mailed the garage to ask for more info. so imho, either go for a decent lease, or get a cheap loan and buy … so imho, either go for a decent lease, or get a cheap loan and buy outright. cold from me. I think that's missing the point. It seems cheap because there is no deposit. I would think most lease companies want at least a few payments up front. Yes, it is likely to be cheaper buying outright (ideally from savings, which would otherwise get zip in the bank) but many people cannot do that or would not want to for whatever reason. Great deal if its available. Would love this deal if it is true about no upfront fees. Can you pay extra to do more miles ? Could you link to the leaflet? Scan/photo etc? You need 2 years no claims discount, so no good for first time drivers. If you have been driving for minimum 2 years without any incidents then good deal for them. 1.0 208 is gonna be woefully underpowered. It can't be nil deposit surely. We need to see this flyer. Even if the flyer says this, they'll surely not honour it, and claim it was a printing error. If it is, then this is as hot as my pants!!! I would bite your hand off for this deal. Anyone know of similar in … I would bite your hand off for this deal. Anyone know of similar in Glasgow? In the era of 1.30 per litre petrol, speed cameras on every other road, and readily available car parks like the M25 the 1.0 seems to make a lot of sense. 68 BHP seems adequate for a city car or young driver. seems a bargain for about a fiver a day.. This deal doesn't include insurance. Went in last week. Initial quote over the phone was too good to be true! In reality it's around £300 onwards depending on deposit. Road tax is only £35 a month. This just add fuel name is misleading. Should read just add fuel, insurance, deposit, and road tax plus extra ££ for a colour other than white. I've got a 1.2vti. It's not fast (so this'll be REALLY slow), but the 3 cylinder turbo engine sounds nice. Pretty bad transmission shunt though so avoid if you're going to be trundling around in traffic queues. You cannot slow down in 2nd and then accelerate again smoothly (without riding the clutch that is). I don't think you have to make a final payment. Just hand the car … I don't think you have to make a final payment. Just hand the car back.I'm really hoping someone else might have more info on this specific deal, since it would seem to be better than the regular "Just Add Fuel" offer, in that it has no deposit.I have e-mailed the garage to ask for more info. you don't have to make the final payment, no. but they deliberately limit it to 6000 miles per year..... if you only do that mileage, get a pushbike, but really they want people to do more than that which kind of forces you into making the final payment and keeping the car. I went to the garage about this offer. Thought sounded great untill the salesman annoyed me. U have to pay a deposit however they will accept a lower deposit and increase the monthly payment. As I'm not a 40year old man who loves in the best area the price is not 159 for the 208 it's 171 per month with the deposit on the terms and conditions. You have to have no claims for the past 2 years. You can add another named driver but will cost more and also has to have no claims. All in all good deal but not what is says on the time unless according to sales man "your a 40 year old man"
It can't be nil deposit surely. We need to see this flyer. Even if the … It can't be nil deposit surely. We need to see this flyer. Even if the flyer says this, they'll surely not honour it, and claim it was a printing error.If it is, then this is as hot as my pants!!! I don't have a scanner at home, so cannot scan it. It definitely says "Nil deposit" in big red letters, followed by "Only £149.00 per month". Like I say, I've e-mailed them to ask for more details and will post here when/if I get them. I don't have a scanner at home, so cannot scan it. It definitely says … I don't have a scanner at home, so cannot scan it. It definitely says "Nil deposit" in big red letters, followed by "Only £149.00 per month". Like I say, I've e-mailed them to ask for more details and will post here when/if I get them. I wasn't so much calling you a liar, it just seems far too good to be true. Ok it's underpowered and you never own it, but who really owns their car these days? In truth you do not own your car if you have any finance on it, and this way you don't have to worry about insurance, tax, servicing etc. it's an absolute steal!!! Good man. I wasn't so much calling you a liar, it just seems far too good … Good man. I wasn't so much calling you a liar, it just seems far too good to be true. Ok it's underpowered and you never own it, but who really owns their car these days? In truth you do not own your car if you have any finance on it, and this way you don't have to worry about insurance, tax, servicing etc. it's an absolute steal!!! 6,000 per year? may as well walk.